Marshalls Mill, the largest office building on the Round Foundry estate in Holbeck Urban Village [HUV], is 100 per cent let for the first time since it was refurbished in 2001. 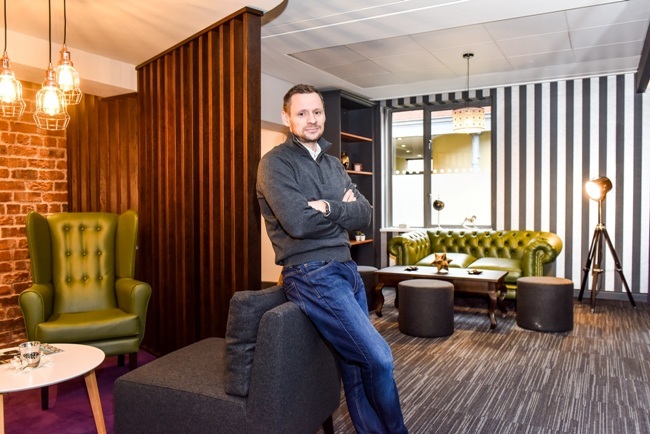 Three businesses – Robot Food, True North Productions and We Are Boutique – have expanded into new office space within the estate, in a trio of deals secured by commercial agents, Creative Space Management. Spread over six floors, the Grade II listed old flax mill was refurbished extensively in 2001 with further refurbishment in 2011 and early 2012, and is now home to a unique community of fast-growth digital and new media companies. Robot Food, an independent strategic brand design agency, is set to take 1,100 sq ft of additional space in Marshalls Mill. Set up in 2009 by director Simon Forster, Robot Food has experienced rapid growth since moving to the area in 2012. The company was originally located in Harrogate, moving to a small unit in the neighbouring Tower Works development before relocating to Marshalls Mill in 2015 due to business expansion. Following a series of new client wins in 2016, Robot Food now have 17 staff and plan to expand into the new office space in the new year. “Marshalls Mill was the obvious choice for us as it’s a beautiful building full of great spaces,” said Simon. True North, the fastest growing independent TV production company outside London, has taken up an additional 1,184 sq ft in Marshalls Mill, bringing its total office space to 7,920 sq ft. The company, which has been based in HUV since 2009 now has 120 staff and was recently nominated for a prestigious Broadcast Award for its work on Channel 4’s ‘A New Life in the Sun’. Work on programmes such as ‘Teen Mom UK’ for MTV and ‘The Highwaymen’ for the BBC have contributed to continued business growth and the company is now expanding their television production and delivery facilities to handle the increase in demand. Another HUV tenant which is on the move is We Are Boutique, a media communications agency. Established in 2011 by managing director Simon Bollon, We Are Boutique have made the move from Marshalls Mill into a 2,955 sq. ft space in Saw Mill Yard, also in HUV, allowing neighbours Robot Food to expand in the Mill building. Paul Taylor from Creative Space Management said: “We’re delighted to mark the 100 per cent let milestone for Marshalls Mill for the first time. The Round Foundry and Marshall’s Mill estate has a reputation for attracting and retaining fast-growth businesses and these latest deals are a testament to this. Holbeck Urban Village, a major part of the city’s South Bank Leeds, has earned a reputation as the city’s home for pioneering companies with its mix of restored historic mill spaces, flexible, contemporary interiors and a digital infrastructure that offers the fastest on-demand broadband service in any multi-occupancy building in Leeds. There are a range of refurbished and flexibly designed suites in Marshalls Court and Round Foundry currently available to let ranging from 300 sq ft to 4,300 sq ft.